While camera manufacturers such as Minolta are exiting the photography market altogether, computer companies are sneaking in through the back door. 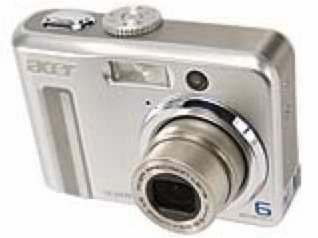 Along with the likes of BenQ, which sell rebadged Pentax compact cameras, Acer has also joined the fray. The 6Mp Acer CE-6430 looks a bit of a bargain at just £110, with some other 6Mp compact cameras like the impressive Fujifilm F30 costing more than twice the price. The Acer's specification list puts ticks in most of the right boxes. Along with a sizeable 2.4-inch LCD, the 3x zoom lens gives an equivalent focal length to a 34-102mm lens on a 35mm camera. This offers a useful wide-angle setting at one end and a short telephoto at the other. Distortion is reasonably well controlled even at both extremities of the zoom range. For a top-up at the telephoto end, there's also 1x to 4x digital zoom, although image quality drops off quite alarmingly the more digital zoom you use. Along with fully automatic and 'Program' shooting modes, you get four scene modes: Portrait, Landscape, Sport and Night settings. These all do pretty much what they say on the tin. Further tweaks enable burst shooting mode, with up to three shots per second, manual override of white balance, /-2 EV exposure compensation and all the usual flash modes. However, there are no slow-sync or rear-curtain settings. Other standard fare includes a self-timer and a macro mode, which works down to a distance of 5cm. Frustratingly, however, Macro mode is only useful at wide-angle zoom lengths, and a minimum focus distance of 30cm is required at the telephoto end. Switching the camera on, our review model took about four seconds to ready itself, which is pretty average. More frustratingly, after each shot, the camera took almost four seconds to write to even a high-speed SanDisk Ultra II SD card. You can take a second shot in slightly less than this four second period, but you can't adjust the zoom for full use of the camera until the write phase is completed. One cost-cutting measure in the CE-6430 is its relatively small 1/2.5-inch CCD sensor. Squeezing 6Mp out of this makes image noise diffi cult to deal with, which is no doubt why the Acer's maximum sensitivity is a disappointing 200 ISO. By contrast, the Kodak EasyShare C360 and Panasonic DMC-LS2 opt for a more conservative 5Mp resolution from this sensor size, offering maximum sensitivities of 800 and 400 ISO respectively. As it is, image noise on the Acer is minimal at its base 64 ISO setting, rather noticeable at 100 ISO and quite poor at 200 ISO. The Acer was poor at shooting at 200 ISO, with images being appallingly over-exposed. Strangely, the problem didn't occur when the camera selected ISO 200 while it was in Auto ISO mode, but dialling the setting in manually made the camera unusable.